What is Field Monitoring - Screening Inspection by Condition Monitoring : Field Monitoring | LAZOC Inc.
What is your main concern, Leakage, Collapse, Deformation, Crack, Abnormal Temperature, Abnormal Pressure, Vibration, Peeling, Erosion, Corrosion...? With assets aging and with management's demand for cost-cut, CBM(Condtion-based Maintenance) and RBM(Risk-based Maintenance) are being applied everywhere, rather than traditional TBM(Time-based Maintenance). In view of CBM, it is important to know the condition of such civil assets and industrial equipments on line, so-called "Condition Monitoring" or "Screening Inspection". 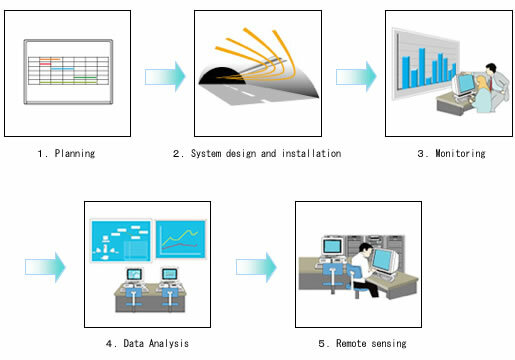 We provide such"Monitoring and Screening Service" including planning, design, installation, monitoring, and data analysis.